Historic London districts re-branded Midtown. Or have they? Holborn, Bloomsbury and St Giles seem to have been part-privatised and part-rebranded under the banner of Midtown. Midtown: ridiculed but here anyway. The historic London districts of Bloomsbury, Holborn and St Giles, epitomised in the writings of Charles Dickens and others, seem to have been partly re-branded Midtown by the Holborn Business Partnership and with the backing of Camden Council. The Midtown name was never popular, except with estate agents and a handful of big businesses, and was laughed at in the press when it came to public attention in early 2010. Camden Council did not consult with any residents about a re-branding or the imposition of a Business Improvement District (BID). 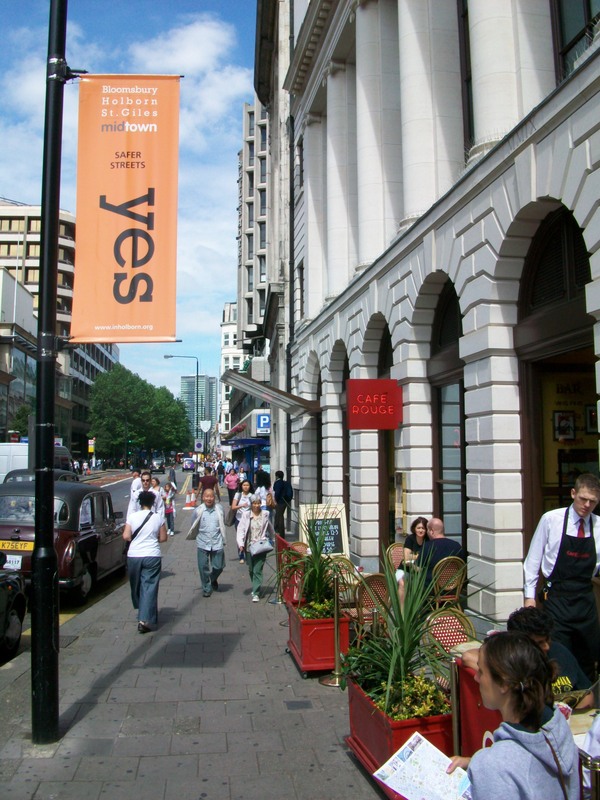 The Council allowed banners endorsing a “yes” vote to an expanded BID to be displayed on public property throughout Bloomsbury, Holborn and St Giles. On 1 April an expanded BID area started. There was no fanfare for this announcement, just a quiet mention on a website of “A new team for a new area, and era”, introducing the Midtown Rangers, and a new internet domain name of inmidtown.org which was registered in April this year. I spoke to the kiosk newspaper vendor near Holborn tube station. So is this area called Midtown now? I asked. “I don’t think so, mate. It’s Holborn. Always has been since I’ve been here, and I was born here,” he tells me in no uncertain terms. What about these guys dressed in orange that are wandering around with Midtown Rangers written on them? And where are they today? When I rang the offices of InHolborn on the number given on their website the woman who answers the phone says: “Hello, InMidtown.” I ask her has InHolborn been changed to InMidtown? She tells me that the new name is being used because the business improvement district now covers a larger area than before. She explains that they still want to keep the name St Giles, Bloomsbury and Holborn and that InMidtown is just a “brand name”. What’s the point of the “In” before “Midtown” I ask? “I don’t know. It’s just a brand name,” she says. Previously the brand name was InHolborn. The website still uses InHolborn most of the time. I ask about the relationship between InMidtown and the Midtown Business Club. She tells me she’s not sure about how they are related. But it’s the Holborn Business Partnership that are running InMidtown. Confused? But I think it’s meant to be that way. It’s part of the “quiet revolution” to part-privatise and create more unsustainable commercial activity in London. Much of it they hope to be gained by tourist activity, more cafes and restaurants, licensed premises and other entertainment. Business Improvement Districts were a New Labour idea imported from the USA. Now Mayor Boris Johnson is championing them and wanting to see BIDs in Fitzrovia and other parts of London including Whitechapel. The big impetus for InMidtown is the promise of increased visitors and shoppers who will firstly be coming to London for the 2012 Olympics and secondly who will emerge from the £17bn Crossrail project due to be completed in 2017. Crossrail will tunnel underneath central London with stations at Paddington, Bond Street, Tottenham Court Road, Farringdon, Liverpool Street and Whitechapel. It will link Heathrow airport directly to central London and The City. There’s no room for any more motor-vehicle traffic in central London so the only alternative is a growth in underground railways, cycling (hence the Mayor of London’s cycle hire scheme) and walkers (hence Legible London Street signs). It’s all about getting more visitors and other people travelling into central London: a net increase of people to work and spend money in central London. Grabcocque‎: The signs here are trying to rebrand Holborn, Bloomsbury and St Giles as ‘midtown‘. I am not amused. untilnextyear‎: Bloomsbury, Holborn and St Giles appear to be rebranding themselves as “Midtown“. Oh dear. eugenievt‎: @fitzrovianews @andrewrjw I have asked InHolborn to stop referring to Holborn/Bloomsbury as ‘Midtown‘ as well, but they won’t listen. trixie‎: @heawood Someone told me yesterday that Holborn is beginning to be referred to in London as midtown. Yuck. Kerry_Potter‎: I went to Holborn today and noticed it’s rebranded itself as ‘Midtown‘. Um, really? If you are concerned about issues in and around Holborn, get in touch with Holborn Voice a new community website.